The moor had a nice dusting of snow, so good to feel snow under foot again and walk in icy puddles. A biting wind as I walked under leaden skies. 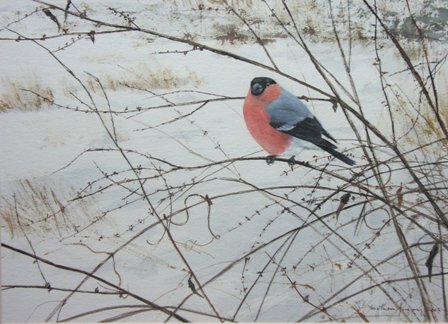 The only birds seen on the top of the moors were, perhaps surprisingly Bullfinches. A flock of about ten were feeding on heather seeds. Lower down I had superb views of a Hen Harrier hunting. It scattered Lapwing, Golden Plovers, Fieldfares and Woodpigeons in its path. It flew right over me only about twenty five feet above, staring me in the face with its owl like eyes as it passed. Shortly afterwards luck stayed with me and I had good views of a Goshawk, it too stirring the flocks in the fields. Once it has passed the lapwings settled close to me, resuming their feeding in the ploughed field and giving me great views. Found this gorgeous Tawny Owl today on a fence bar in a sunlit hedge. It was obviously soaking up some winter sunshine on this cold day. 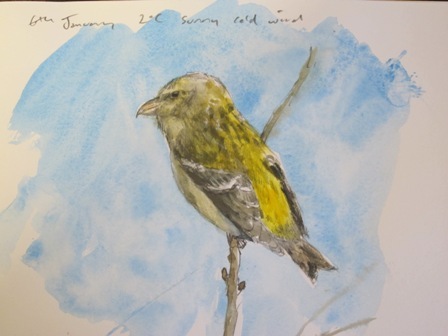 The temperature was about 1 c when I sketched from a range of about twenty feet. Lovely warm brown feathers were accentuated by the low winter sun. Finding a Tawny Owl in daylight can be difficult and this was undoubtedly my best ever daylight view of this common but beautiful owl. 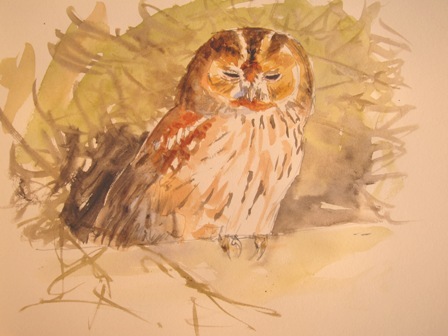 In September I will be leading another sketching course at The Pheasant Hotel Harome, North Yorkshire. We had an excellent day in March in very fine weather using the beautiful surroundings of Harome. A delicious lunch and wine was provided as part of the course, a chance to socialise and reflect on a lovely morning sketching. Once again the emphasis of the day will be upon enjoying sketching the village, in particular the area by the pond where ducks, trees, water and of course sky can all be tackled. You will need basic watercolour brushes and paints, pencils, a water pot and a good quality cartridge or watercolour sketchpad. A folding chair might also be useful and clothing to suit plein air sketching! The cost which includes coffee and lunch will be £45. 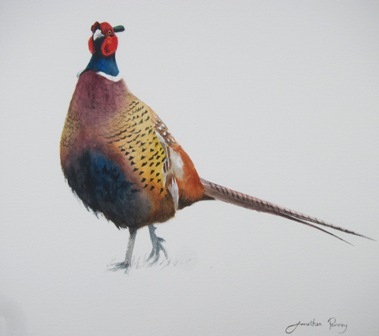 For more information or booking please contact the Pheasant Hotel on 01439 771241. 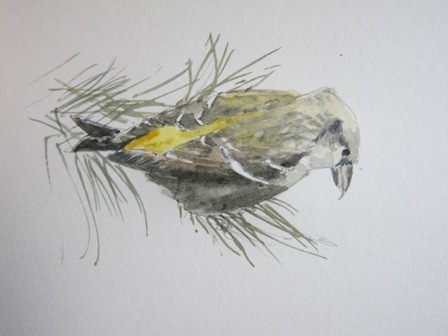 A return to the moor to sketch Crossbills was fruitfull after a long walk. I eventually found the flock about a mile from where it was yesterday and as I set up my scope to sketch and photograph them the sleety rain fell! 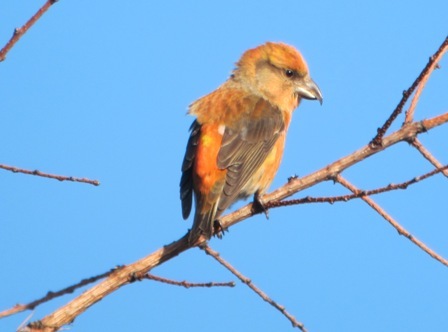 But I did relocate the wing barred bird and I am now almost convinced that this is an unusual variation in Common Crossbill plumage. 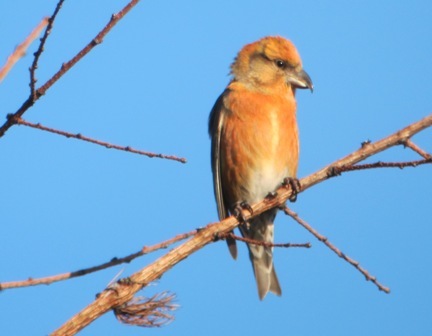 I have also included some photographs taken yesterday of male Crossbills. These were taken using a Canon Powershot S95 hand held to the lens of a Swarovski HD 65 scope. 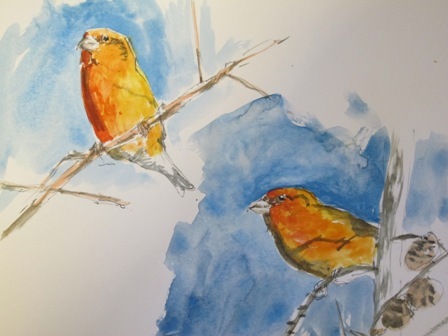 Went to the moor today to sketch the Crossbills. It was very cold in the brisk north westerly wind but the winter sunshine was very bright. 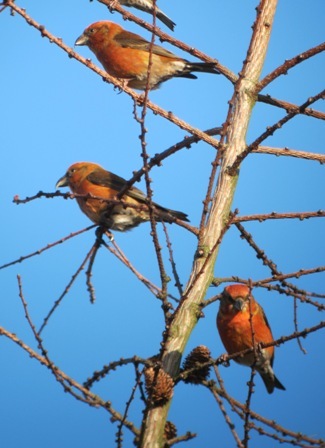 A flock of about 40 crossbills gave stunning views down to about twenty feet. The males very beautiful in bright breeding plumage. I have attempted to do justice to this in the sketch. The bright orange red against a crisp blue winter sky is a sight etched on my mind. With them were greenish coloured females who are bright in their own right with vivid bronze yellow rumps. All the while the males were singing quietly. Then suddenly I noticed a female with two wing bars. 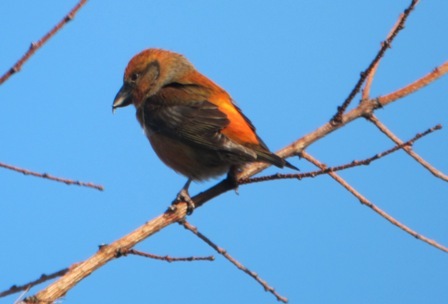 Could this be a rare Two- barred Crossbill? A very exciting record if confirmed, but if not, what a glorious couple of hours to spend with these charismatic finches.